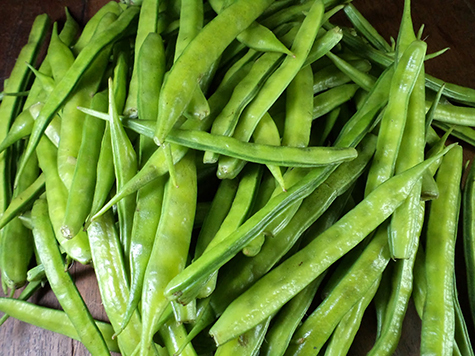 Cluster beans are legumes widely grown in India, they are made into thorans or stir fries, added to many vegetarian dishes like Sambar, Avial, Sindhi Kadhi etc etc. In South India, while shopping for Sambar veggies, the vegetable vendor will throw lots of cluster beans along with other veggies. My mom never used to cook cluster beans, I have no idea about the reason behind her dislike towards cluster beans. The other day, while talking with my mom I have found that she has started cooking with cluster beans and makes thoran quite often. You wouldn’t find this vegetable at any North American grocery stores. You need to go to Indian stores to buy this. During my last visit to the only Indian store in my city, I found lots of fresh cluster beans and was tempted to buy them. 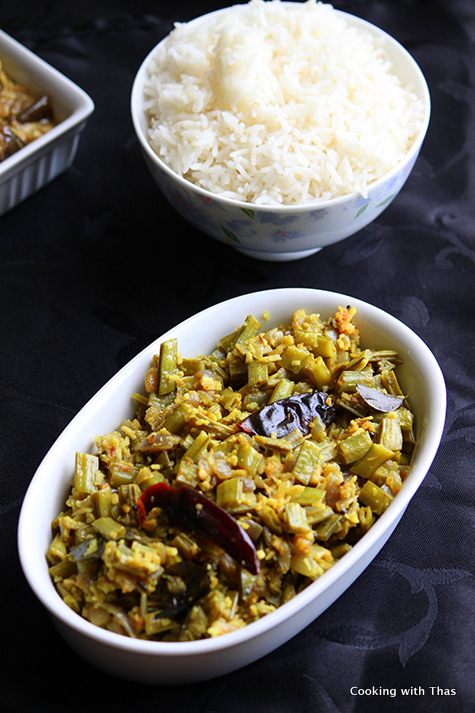 This was the first time I had cooked with cluster beans and I made thoran or cluster bean- coconut stir fry. 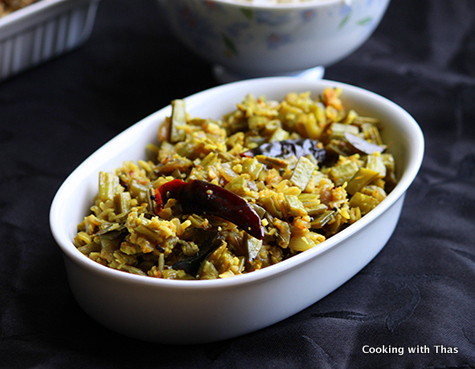 Thoran is the Malayalam name for veggie and coconut stir fries. Any kind of veggies can be turned into a thoran. In a typical Kerala lunch, there will be always a thoran served along with rice and veg or non-veg curries. I googled about the health benefits of cluster beans and was amazed to learn that it has amazing health benefits. What more do we need to include cluster beans into our diet? Next time, if you spot cluster beans do grab them and make this healthy and nutritious side dish. In a food processor, coarsely grind the coconut, green chili, garlic, cumin seeds and turmeric powder together. Keep aside. Add mustard seeds, let it splutter. Add whole dry red chili and curry leaves, saute for a couple of seconds. Add onion, season with salt and saute till translucent. Add cluster beans and add ¼ cup water, cook covered till cluster beans have turned tender. Add the ground coconut mix to the cooked cluster beans, season with enough salt, combine well and cook for a few minutes till the raw smell of coconut goes away and the mixture gets dry.